Honda's slogan in 1983 was "We Make It Simple", but back then this was really a pretty technically advanced car (at least for a small, relatively inexpensive car). 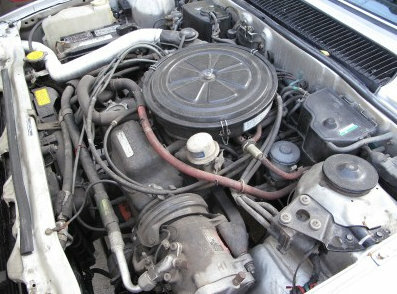 It had Honda's very advanced CVCC ("Compound Vortex Controlled Combustion") engine, which featured 3 valves per cylinder. 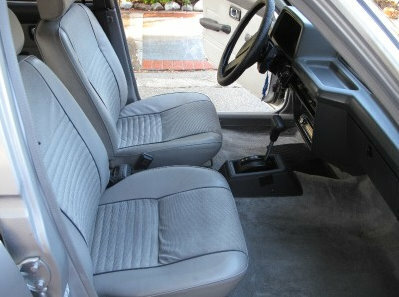 It also came standard with features that were optional, or not available at all, on other small cars (i.e. rear window wiper). Located in Valley Village, CA, click here to see the eBay listing. You can now follow Just a Car Geek on Facebook! 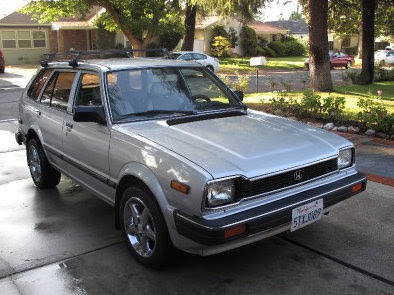 For those too young or not born yet,the amazing thing to me about this generation Civic and the first generation Accord, was how Honda sold them during the late 70's early 80's. You literally had a choice of two...count em...two colors (I think it was the 79 Accords Sedans were either metallic puke Green or cat hairball light tan). No factory options other than transmission choice. And HUGE dealer markups (along with various dealer installed crap...maybe the wheels on this one is original after all from the dealer). And they sold EVERY one of them...it was actually hard to find a dealer that had one to sell. Notice the Alfa Spider next to the Civic, also with blingy wheels... cool pairing since both were engineering-driven companies putting out creative solutions for small-displacement engines. You still see these every so often on the west coast... usually no rust, but bleached out. 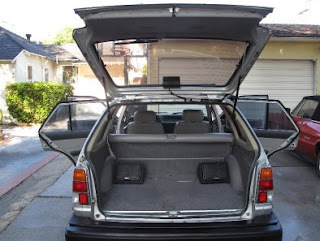 This was my favorite car (explaining a lot about my weird tastes) when it was new. The rear wiper, serious rear seat room for a tiny car ...and a COIN BOX. To me, that ruled. It was something I'd never seen in a car and from always hunting the floor for my mom for meter money- genius. It was also the first time I'd noticed a car company actually thinking about how people use cars. I knew people that waited months for one. I could be wrong too, but wasn't Honda pushing 5-speed manuals quite a bit before anyone else? Honda could only dream of such relevence today. I just wonder what kind of person would buy this. I mean, there are certainly more practical safer cars today that get good gas mi. However maybe this one would be easier to work on and cheaper to maintain? Otherwise maybe someone would buy it, stick it in the garage for another 10 years hoping for potential collector value? It's certainly no chick magnet!